If you suffer from allergies, you can experience a variety of symptoms that make you feel bad. Depending on the type of allergies you have, your symptoms may flair up only during certain seasons or throughout the year. When you have allergies, your immune system treats normal, harmless substances in your body like harmful invaders. To protect you against those invaders called allergens, your body releases a chemical known as histamine. 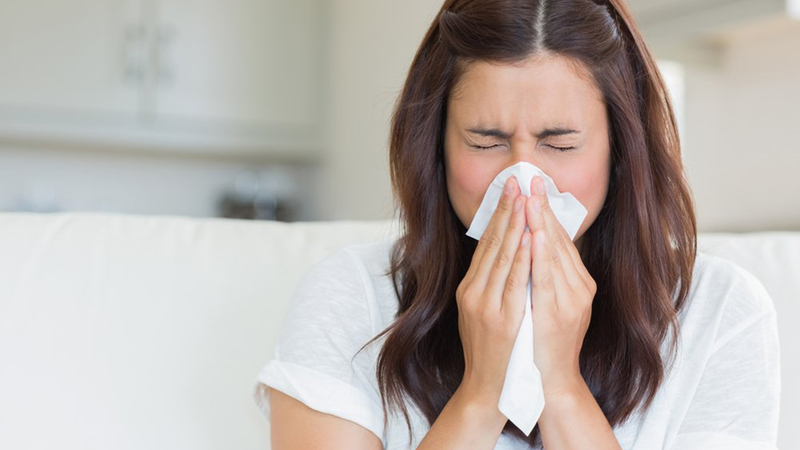 Allergens can produce sudden symptoms that include sneezing, runny nose, itchy, watery eyes, nose and throat, and sinus congestion. Any of these symptoms can make you drowsy, fatigued, lethargic and irritable. If your allergies include upper respiratory symptoms, your sinuses can become swollen and blocked and cause difficult breathing. Many people with chronic sinus congestion have difficulty breathing through their nose which often leads to chronic fatigue, headaches, sleeping problems, and sinus membrane perforation. Most people think that seasonal allergies only occur during warm spring and summer months, but they can occur year-round. * Spring – The biggest outdoor allergen during spring is tree pollen. In early spring when trees are sprouting new green growth, tree pollen is freely floating through the air. * Summer – Although many things are blooming during summer, grass pollen is the allergen that causes the most severe symptoms. Mowing the grass without a mask can set off a variety of symptoms that make you feel terrible. *Fall – While the crisp cool air of fall may feel great after summer, fall is a common time for ragweed and mold allergens. Ragweed pollen travels in the wind, while mold grows on wet leaves and soil. * Winter – Pollen levels are lower during winter, but mold spores can still trigger symptoms. Indoor allergens like pet dander and dust mites are worse during the winter, so take precautions. People love their pets, but many pet owners suffer from pet allergies caused by dead skin cells and proteins found in animal dander. Pet allergens from cats and dogs can stay in rugs, carpets, and fabrics and linger in the air for months. Regular vacuuming with a HEPA filter vacuum, weekly pet baths, and brushing your pets outdoors will help reduce pet allergens in the house.